Fairytale Wedding is a Wedding Decor, Designing and Planning Company with over 8+ years of experience where we put our efforts towards creating a wedding that is not less than a fairytale or the wedding of your dreams. Be it a small intimate gathering or an extravagant affair, every Fairytale Wedding is one of its kind. Everything we do is with passion and we aim to make sure that all our efforts to glorify your celebration exceed your expectations. We work with the best in the industry and together we set trends as opposed to tail them. Our philosophy is fairly simple. We aim to help you plan and create a remarkable wedding which is exceptional. The most important element that we aim for is custom made luxury planning and design service. We seek to work with you to ensure that your event is personal which reflects who you are and states something about your shared values and sense of style. Whether you want a traditional elegant wedding or a contemporary modern wedding, we got you all covered. With our approach to wedding planning and design we make sure to make your event exactly as you desire; from the decor and styling to flowers, from entertainment to your attire and much more. With us working with you the only thing you need to do is have a great time and relax and enjoy a magnificent celebration managed and designed to perfection. At Fairytale Wedding, we plan beautifully elegant and luxurious weddings pan India. Ours is a flexible and personal approach to make your big day and the events around it worth remembering for years to come. Priya Gupta is the owner of Fairytale Wedding who has earned a name for her elegant design style and personalised service. With an education and work background in Fashion Designing from NIFT (Hauz Khas), Delhi she decided to venture out and open Fairytale Wedding, a one stop solution to all aspects of wedding planning. With her avid experience in Indian wedding planning and her extensive network of wedding vendors, she ensures that you stay stress free on your big day. 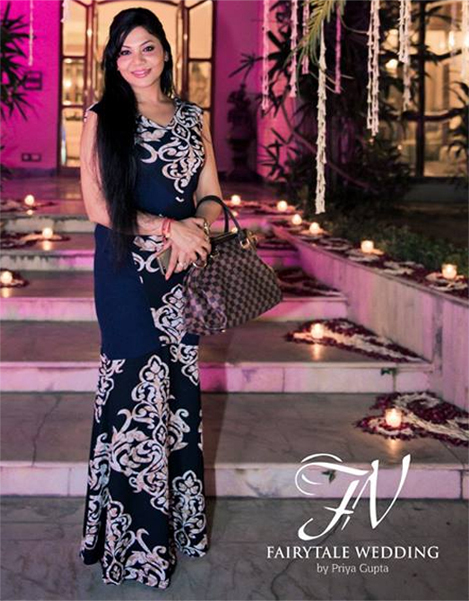 Apart from being an accomplished wedding stylist, Priya Gupta is also known for her exquisite Event Planning. So whether it is a private party or just cocktails, a big corporate event or something of a niche, she is sure to craft an all pervasive experience for you and make your event unforgettable for years to come. Priya Gupta’s meticulous attention to detail and an established reputation of being dependable & trustworthy has set her apart from the rest in the league. She ardently keeps participating in various wedding exhibitions like Bride & Groom, Wedding Asia etc. She also happens to be the décor partner with Bride & Groom.